PGA of Sweden present a unique event with the short game guru. 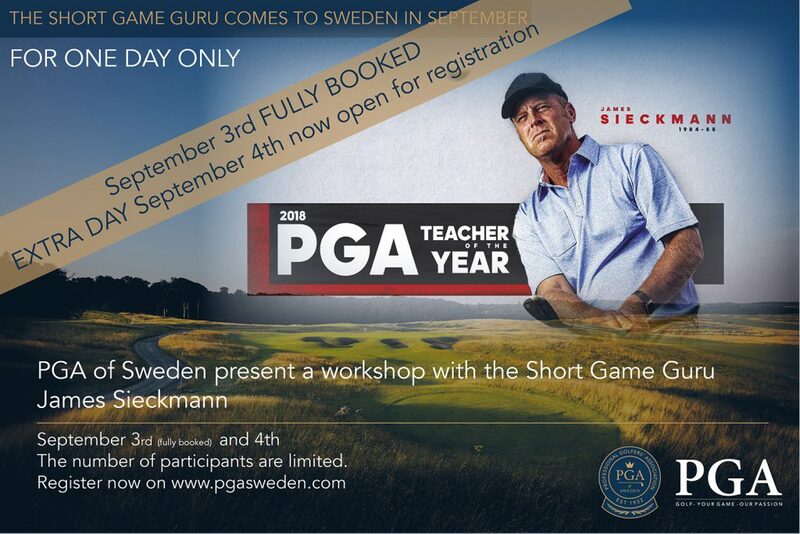 James will be at PGA Sweden National to do a workshop for PGA Professionals on September 3 and 4. We sold out the first day with James in just a few hours. Therefor James will stay and do a second day only for PGA Professionals and for Tour Professionals. Register now! First come first serve apply. The workshop is open for PGA Professionals of any PGA. You will learn short game and putting from one of the masters of the short game. The seminar will be both theoretical and practical containing Short Game, bunker and putting. Venue: The PGA of Sweden National. 4 September 2019 09:00 to aprox 17:00 Register now! limited number of participants. 2500 Sek plus VAT for PGA of Sweden members. 3500 Sek plus VAT for other national PGA members. Don’t miss this unique opportunity to learn from James in person. Register and make sure to secure your spot in the workshop by filling in the form (scroll down). For the last 25 years James has served as the Director of Instruction at The Golf Academy at Shadow Ridge Country Club in Omaha, Nebraska. He is the 2018 PGA of America’s National Teacher of the Year and is a nine time recipient of the Nebraska PGA Section Teacher of the Year Award. He is a fixture on GOLF Magazine’s Top 100 Teachers in America list, and ranked 16thby his peers in Golf Digest in their Top 50 Best Teachers in America lsit, but first among short game specialists. He has shared his unique beliefs on short game performance and effective coaching though a DVD Instruction Series entitled “Phase 5 System” and authored two books, Your Short Game Solution: Mastering The Finesse Game from 120 Yards and In and Your Putting Solution:A Tour Proven Approach to Mastering the Greens. James is on the Titleist Performance Institute Advisory board and shared his knowledge and experiences with many pro’s around world including his own Coaches Only Short Game Workshop, Golf Education Asia, The World Golf Fitness Summit, PGA Sweden, PGA Spain and the Federation de Golf Columbia. He is the current Short Game Coach to 13 fully exempt Tour players including Stewart Cink, Ben Crane, Tom Pernice and 17 Ricoh Women’s Open Champion I.K. Kim. If other PGA than PGA of Sweden, which PGA?